There are many great ways to get involved and serve at CAC. One of those ways is through Mustang Missions — an outreach organization led by CAC students, faculty and parents. Its purpose is to allow the CAC family to put into practice what the Bible teaches about giving and serving others. Mustang Missions is dedicated to offering time, goods and love to the communities around Arkansas, and sometimes beyond! Whether it be through serving a meal, helping with disaster relief or providing Christmas for foster children, Mustang Missions is showing Christ to the community. Mustang Missions aspires to do just as the Bible commands in Matthew 5:16. The theme for Mustang Missions is “For the Father.” This tagline has been the guiding principle for every service effort performed by the CAC family; that the shining lights of service may only praise our Father in heaven. Each year, CAC’s student outreach program called Mustang Missions hosts students from the ACCESS School for a day of support and encouragement as the ACCESS track team prepares for the Special Olympics. 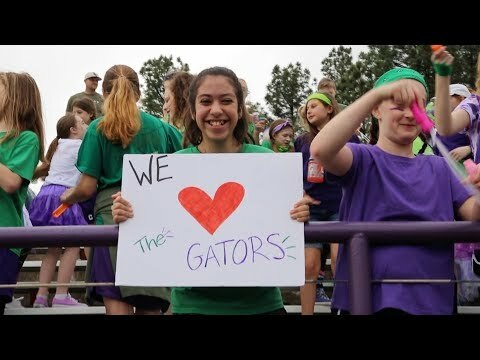 This past year, the entire secondary student body joined Mustang Missions as they cheered on the Gator athletes.